“It is easy to get a thousand prescriptions, but hard to get one single remedy“. Pharmacy is one of the top courses opted by students across the country. Pharmacy profession includes the industrial and practicing sector undergoing a rapid change. Candidates who are willing to start your career in the field of pharmacy have to crack any one of Pharmacy Entrance Exams. We have listed here National Level & State level Pharmacy Entrance Exams in India. Also, check here Entrance Exams for Pharmacy after 12th class through this page. Presently, there is a great demand for pharmacologists in various areas of such as pharmaceutical research and development, production and manufacturing, analysis and testing, marketing, hospital pharmacy, community pharmacy, etc. Pharmaceuticals Sciences basically aims at teaching its students how to dispense and prepare medicines. Aspirants who are willing to pursue a degree in the field of pharmacy can know the list of Pharmacy Entrance Exams. Through Pharma Entrance Exams, candidates will get admissions into Undergraduate (UG), Postgraduate (PG) and doctoral (Ph.D.) levels. The major courses in Pharmacy are M.Pharm, B.Pharm, D.Pharm, Ph.D., etc. Entrance Exams for Pharmacy is conducted at national level, University & state level. 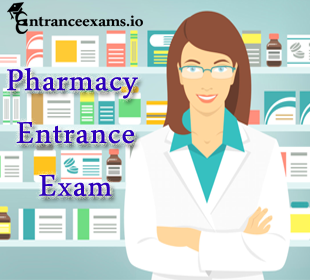 Candidates who want to hold a degree in this field, the first and foremost thing is to know the Pharmacy Entrance Exams that are conducted every year. The National level Entrance Exam for Pharmacy is listed here. It is a National Level Entrance Exam conducted by AICTE every year as per the directions of Ministry of Human Resource Department (MHRD), Government of India. GPAT Exam is a gateway for the candidates to get the admissions into master programs in Pharmacy such as M.Pharma. Check State Level Pharma Entrance Exams provided through the below sections on this page. APEAMCET is a state level Entrance Exam. JNTU, Kakinada organizes AP EAMCET to provide the admissions into Pharmacy, Engineering, Agriculture & other courses in Andhra Pradesh State. It is a State Level Entrance Exam regulated by Andhra Pradesh State Board of Technical Education and Training. Through AP PolyCET Exam, candidates will get the admissions into various diploma courses offered by different colleges in the State of AP. Andhra University, Visakhapatnam conducts AP PGECET Exam on behalf of Andhra Pradesh State Council of Higher Education. Through Andhra Pradesh PGECET Exam, candidates will get the admissions into post graduate courses such as M.Tech, M.Pharma, etc in various institutions/colleges of AP State. Jawaharlal Nehru Technological University, Anantapur on behalf of APSCHE conducts ECET Exam every year. Through APECET, the officials will provide the admissions into 2nd year B.E/B.Tech/B.Pharma courses offered by institutions/colleges in Andhra Pradesh State. Expanding pharma’s industrial and practice sectors needs technically and technologically trained pharmacy professionals who face global changes and compete with multinationals. The pharmacist is nothing but the mere dispenser of drugs and plays a crucial role in the medical management and overall health care programmer. Pharmacology is the branch that deals with the study of drug action. Visit our site entranceexams.io regularly for more updates on Pharmacy Entrance Exams Dates & Notifications.